The number of opportunities for IT workers to donate their skills to a good cause is growing, with charities crying out for their help. 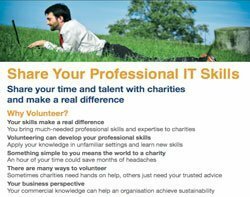 IT4Communities wants to attract as many IT staff as possible to consider volunteering their time and skills. The organisation matches IT volunteers with charities, saving the charities money and providing volunteers with fulfilling work. An IT volunteer can make unique improvements to organisations with skills most people do not have. Creating a website, for example, might sound easy for those in the know, but for many charities, even basic IT tasks can seem impossible. There is a long list of charities in the UK desperate for the skills of IT professionals, and those volunteers who already volunteer say it is fulfilling and fun. Most of the charities accepted by IT4Communities are small, local organisations, as the bigger, well-known names such as Oxfam and Amnesty International have their own, well-funded IT departments. Yewande Olowande from west London has been an IT consultant for 20 years, working for companies such as British Gas. She has used her skills to help no fewer than six charities. Since 2004, she has been working with charities such as Age Concern and Time for Families, which provides relationship courses in prisons for offenders and their partners. "It almost becomes addictive once you realise how big a need there is for your skills.I enjoy the idea of helping people who cannot afford good quality IT consultants. I found the charities were getting sub-standard service, despite paying a lot of money," she says. The work Olowandedoes is varied, from teaching people at Age Concern how to research their family tree using the internet, to building databases. Time for Families, for example, needed a database to keep track of the families it was working with and monitor their progress. The charity has staff all over the country and needed a web-based system that would help it keep information securely. Olowande stepped in, creating a bespoke database and providing advice. "A lot of the work I do is advisory work, which I can do remotely.Working from home is good, because organisations are required to pay volunteers' expenses. I taught some of them how to do instant messaging, and we use that to communicate. The good thing about that is that it saved all the conversations, so they then had a sort of manual to refer back to," she says. Olowande says volunteering takes up around 10 to 15 hours per week, depending on how much paid work she has on, andpoints out that it is important to approach the work just like any other job - with professionalism. "I sold myself to the charity, without just assuming they would want me.The best approach is to treat a project like a business opportunity with a paying client, which keeps it professional. I have developed personal relationships with the charities, but I always maintain an underlying professionalism," she says. IT volunteering is not only beneficial for the charity. Olowande says she enjoys the independence she gets from running her own projects, being her own boss while still working in a professional environment, and meeting the challenge of finding solutions to software problems. She was surprised at how unique and in-demand her skills turned out to be, and would recommend volunteering to anyone. "I would absolutely recommend it. It has been fulfilling, and it has helped me to grow. When I have an objective, I am spurred on to learn new things. It helps me to expand my portfolio of skills," she says. Stephen Woodcock from Lemmington Spa is another IT professional giving spare time to volunteering. A systems consultant for educational publisher Scholastic, he started volunteering through IT4Communities a few months ago. "I used to volunteer when I was at university and saw something about IT4Communities on a blog. I had never realised, until I came across them, that there was anything specific for IT professionals to volunteer. The idea appealed to me because IT is what I do, and what I am able to do. Because I had done volunteering a long time ago, I thought I would try to get back into it." He now works for United World Colleges, a charity which provides free scholarships for an international baccalaureat diploma for suitable 16-18-year-olds with the aim of promoting international understanding. Originally, the charity wanted a new application form for their website, for students to apply for the scholarships. But Stephen explained, "It turned out what they needed was more complicated than that. They have quite a complicated workflow around the application process." He works between two and ten hours per week updating their content management system so they can start using a new internet provider. "It is quite complicated," he said. "When it became clear that there was more to it than I expected, I did have to have a think about taking on that much work. But they seemed quite happy with the arrangement and with the idea that it was not going to get done really quickly." Woodcockbelieves that without his help, the work could have got quite expensive for the charity and they may not have been able to do it. It is not just the charity that has benefited. "IT professionals will learn new things and meet new people.People may not realise that you can use your IT skills to volunteer. I did not until recently. Once you are involved, you realise how difficult it is for charities to do this stuff. They do their best and try to do it on their own, but it is difficult," Woodcock says. "I would recommend that other people get involved. It is an opportunity to learn more. IT is the kind of industry where it pays to try to keep on top of everything. This type of volunteering involves learning new things, which can help." And working for free gives him a chance to try something that he is thinking of trying at work, he adds. "I can use it as a kind of experiment, without having to get everyone at work to switch over to something new before I know how it works. It allows me to practice things in a different context and with different people." David Ramos, an IT worker from Spain, came to the UK to improve his English, and ended up volunteering for Oxford-based Home-Start,a charity which provides support and advice for families in need. The charity wanted a new website to help them collect donations online, advertise their services and promote volunteering in the local area. Ramos, who is now doing a computer science degree at Queen Mary, University of London, stepped in to help. He spent his spare time building the site, working with the charity to get its feedback and find out exactly what it wanted. "I found it really rewarding because it helped the charity.We worked well as a team and charity staff were very helpful. It was good for me, because it was very fulfilling and it helped me develop skills while contributing to a working website," Ramos says. As well as being enjoyable, Ramos says the work looked good on his CV and was rewarding because of the value the website has brought to the charity. Pauline Walter of Home-Start Oxford says, "Our new site is also a marketing tool which we feel will enhance the professional ethos and reputation of our charity and which we hope will help us in our future fundraising endeavours." Ramoshas already recommended IT4Communities to several friends. "I really enjoyed my work there. I have a lot of exams at the moment, but will definitely do it again when I have more spare time, he says. IT4Communities was set up to give IT staff a way to use their in-demand skills. It also aims to provide charities with free IT expertise - something many smaller charities need and cannot afford. IT4Communities works with large and small charities, social enterprise groups, and voluntary sector organisations in the UK. To get involved, visit the IT4Communities website. Potential volunteers just need to register, sign into the site and search for opportunities that suit them. Volunteers can request contact details for opportunities that interest them, and then talk directly to the charity to see if they can help. The organisation holds an annual volunteering awards ceremony, celebrating the best and most innovative IT volunteers and projects in the country. This year's winners were announced on 19 February. The organisation is funded by the charitable arm of the Information Technologists' Company and corporate sponsorship.